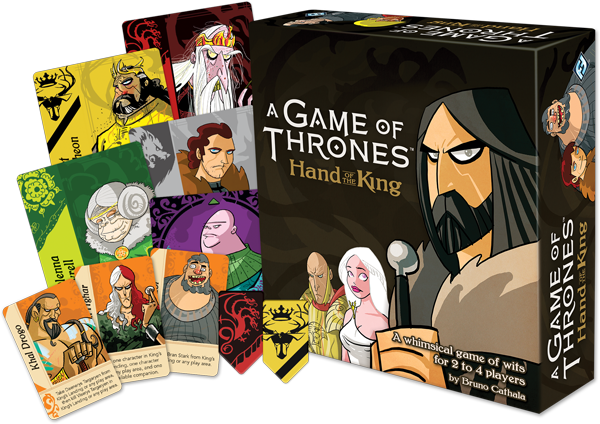 At the beginning of a game of Hand of the King, the court of King’s Landing is laid out before you and the other players. Thirty-six cards—thirty-five characters from the Great Houses of Westeros and Varys—are laid out in a six-by-six square. To become the Hand of the King, you’ll need to gain the support of the most Great Houses, but doing this will hardly be easy. 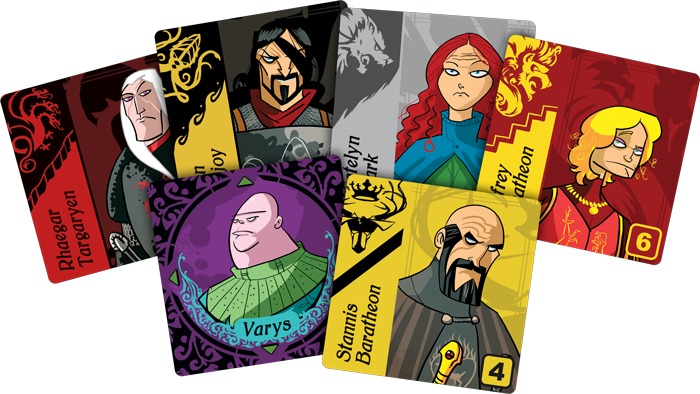 Each turn, you will move the Varys card, choosing a direction and one of the Great Houses. You may move Varys as far as you like in your chosen direction, but you must end your movement on top of a card belonging to the Great House that you named. Then, you claim the card that you landed on, as well as all other cards from the same House that you passed over along the way. For example, you may choose to move Varys to the left, naming House Stark, as shown above. You end your movement on Eddard Stark, and you also claim Bran Stark, because you passed over him on your way to Eddard! Claiming these characters is the primary way that you’ll gain the support of the Great Houses. As soon as you claim at least as many characters from a certain House as your opponents, you immediately take that House’s banner. Whichever player has the most banners under his control at the end of the game is chosen as the king’s new Hand. Of course, each of these Houses has a different number of characters, making it easier or harder to secure their influence as the game goes on. 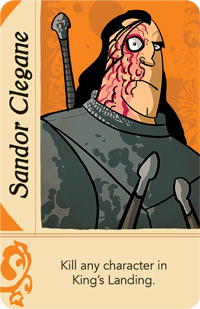 As an added bonus, when a House’s final character card is removed from the King’s Landing court, you can call upon one of the six companions that are laid out at the beginning of the game. 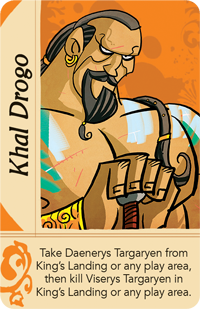 These companions offer powerful effects that can quickly swing the game in your favor, whether you use Sandor Clegane to choose and kill any character or Khal Drogo to pull Daenerys Targaryen to your side from anywhere on the board. You’ll find fourteen different companions in Hand of the King, and since you only see six in any game, you’ll find new ways to interact with the court in every game. It’s immediately apparent that your opponent’s actions will greatly influence your own turns in Hand of the King. You can’t simply choose exactly which characters you want—you’re limited by the position of Varys in the court, which depends on where your opponents have moved him. This doesn’t need to be a handicap, though. In fact, it could be an opportunity. By forging clever alliances with your opponents, you can end up with some mutually beneficial arrangements—just make sure you know when to break those alliances for your own benefit! The king may sit upon the Iron Throne, but in many cases, the Hand of the King is real power in the realm. 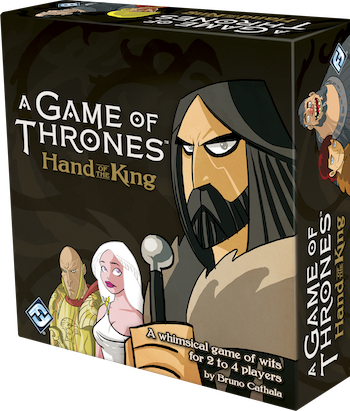 Convince Varys to support your schemes, and gather the Great Houses of Westeros: only one can become the Hand of the King! New Arkham, Star Wars, and Game of Thrones Products Available Now! TM & © 2016 George R.R. Martin & Fantasy Flight Games.